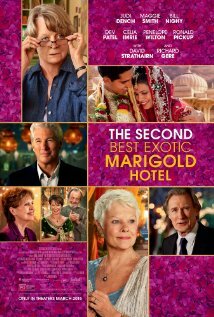 The Best Exotic Marigold Hotel (2011) is about a group of British retirees (or, let us say, “older people”), including Maggie Smith, Judi Dench, Tom Wilkinson, etc., who go to live in a broken-down hotel in Jaipur, India, for different reasons. (Maggie needs a hip replacement, Judi is an impoverished widow looking for a way to live more economically, Tom wants to reconnect with a lost love.) It’s based on a novel called These Foolish Things and was successful enough that it has spawned a sequel named, appropriately, The Second Best Exotic Marigold Hotel. All the same characters are back (except, of course, Tom Wilkinson, who died in the first movie). The Evelyn Greenslade character (Judi Dench) is still the love interest of Douglas Ainslie (Bill Nighy), even though she is seventy-nine and he looks about fourteen years younger. Douglas’ wife, Jean (Penelope Wilton), witnessing the burgeoning dalliance between Evelyn and her husband, departed in a huff (or maybe it was a minute and a huff) in the first movie. She returns in the sequel, briefly, to ask Douglas for a divorce because, she says, men won’t want to date her if she’s a married woman. (This is a bit of self-delusion—men wouldn’t want to date her anyway.) Muriel Donnelly (Maggie Smith) had just about given up on life, feeling cast out after her employer no longer needed her. She finds a new life, however, helping feckless Sonny Kapoor (Dev Patel) manage the hotel. She has the business sense (that he is lacking) that makes the hotel a going concern. And then there’s the hotel itself. They (the British retirees) wouldn’t have gone there in the first place if they hadn’t been made to believe it was something it wasn’t. Hotel owner Sonny Kapoor makes up in enthusiasm what he lacks in competence. After he (with a strong assist from Muriel Donnelly) makes the hotel a success, he wants to expand the operation to a second hotel. He is undercut by a rival, though, who buys the building out from under him and also tries to steal his fiancée. (Once again, Muriel Donnelly steps in with her working-class, no-nonsense approach.) To compound Sonny’s problems, there’s an American guest at the hotel (Richard Gere), who might or might not be a hotel inspector who could cause a lot of trouble if he wanted to. But—wait a minute!—there’s romance in the air for the would-be inspector, so maybe he won’t be so terrible after all! The Second Best Exotic Marigold Hotel isn’t quite up to the original, as far as story goes. That’s because the original was based on a novel and the sequel is based on the original. It is, however, a pleasant couple of hours, pretty to look at with a beautiful music score by Thomas Newman. The best thing about this movie, though, is that Ben Stiller, Adam Sandler, or Will Ferrell are nowhere to be found.